Edgestar Kegerator – What Do Users Say? Find Out Here! 1 The Edgestar Kegerator – A Great Choice For Beer Lovers! 1.2 What Does a Kegerator do? 1.3 Why do I Need a Kegerator? 1.4 Is a Kegerator the Ultimate Gadget for Beer Lovers? The Edgestar Kegerator – A Great Choice For Beer Lovers! 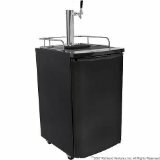 Whether you are a homeowner looking for a way to store and serve your draft beer or a commercial premises or caterer, the Edgestar Kegator is a great piece of kit. On this page, we give you all of the information you need to know about this Kegerator. What Does a Kegerator do? Before we go any further, we feel we should first explain what a Kegerator is. We do this because many people, especially those outside the US and Australia, may not have seen one, so may not know what one is. The clue is in the name, which is a combination of two words – keg and refrigerator. It is basically a fridge that has space in it for a beer keg. Included is a beer pump on the top. To use it all you do is to connect the keg to the beer pump. Why do I Need a Kegerator? It keeps the beer at the right temperature and the air out of the keg. The pump is the same as those used in bars and restaurants. This means that the beer you serve is exactly the same as the draft beer you buy when you are out. It is a fantastic way to enjoy beer at home. There really is no better way to enjoy a drink. Importantly, the beer will keep for months. This means that even if you are not planning a party you will still want to use your keg fridge and pump. You can pour yourself and your partner a couple of glasses to enjoy with your meal and maybe a few more at the weekends. Doing this you will use a keg well before there is any chance of the beer going bad. These days most brewers sell half kegs, which can also be used with this special beer fridge. In addition, there are no more empty bottles to worry about. Drinking beer from a keg is far more environmentally friendly than drinking it from tins and bottles. If you buy your beer by the keg, it is far cheaper. It has become easier for members of the public to buy kegs and many brewers target these customers and tailor their pricing accordingly. It is the beer equivalent to wine in a box. However, it is much, much better than that. To start with there is far more drink stored in the kegerator. The best ones take a full sized keg. On top of that, the beer is being stored at the right temperature and in the keg, so it keeps perfectly, which of course means it tastes great. Is a Kegerator the Ultimate Gadget for Beer Lovers? If you are wondering what to buy your man for Christmas or Father’s day a Kegerator has to go on the list as a quality home product. It is something that a beer lover will really appreciate and, importantly, is a gift they will want to use every day. Most beer fridge pump combinations sold to the public have only one tap on the pump. This is fine for day-to-day use, but if you hold a party, a dual tap kegerator is a far better option. It makes it far easier to serve everyone and keep everybody happy. The fact that Edgestar makes kegerators with two taps is what first got us looking at this particular brand. If you are planning to buy a kegerator Edgestar is definitely a brand we recommend your considering. Virtually all of the user reviews we read were positive. However, not everyone was complementary about this machine. One person reported that the thermostat was set too high. Fortunately, it can be adjusted and most users did not feel this was an issue. A few people said that the assembly instructions were not easy to follow. A few turned to YouTube to find out how to set the fridge up properly. More and more retailers are now selling products like the Edgestar Kegerator. This is great because it means that there is plenty of choice. However, we recommend that you consider buying yours on Amazon. We say this because on this site you get to choose between several models and can easily compare the price. Importantly, you can also read reviews written by actual users. This gives you the best insight into how good the model you are considering buying actually is. In addition, it helps you to determine how practical that particular model will be. When Amazon has a Kegerator sale we let our readers know. This is our way of helping you to get a good quality one for the lowest possible price!